Our injury lawyers handle herniated disc and bulging disc accident cases in Maryland and around the country. One source of confusion for lawyers, patients, and even doctors is the difference between a bulging disc and a herniated disc. Statistically, the difference is not insignificant. 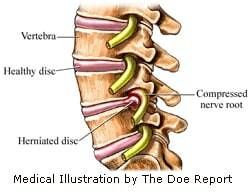 As you will see below, the settlement value of herniated disc cases is typically higher than bulging disc cases. This is not necessarily based on good science: some bulging disc injuries are more likely to cause nerve root impingements than herniated discs. A bulging disc is a disc injury in which the presence of disc material goes beyond the normal margins around at least 50% of the disc's circumference. In contrast, a herniated disc is defined as the displacement of disc material beyond the limits of the disc space that extends less than 50% around the circumference of the disc. If it is a bulge instead of a herniated, it does not sound quite as bad. Obviously, insurance company defense lawyers and their adjusters try to exploit the difference between a herniated disc and a bulging disc. The irony? A bulging disc may impinge nerve roots or the spinal cord more significantly than a herniated disc. Defense lawyers argue that a bulging disc is no big deal. The defense lawyer is likely to say in the defendant's opening statement that when we stand up, we all probably get a little bulging of our discs from gravity alone. More to the point, they argue through their medical experts that disc bulges are not post-traumatic but are degenerative secondary to annular degeneration and/or ligamentous laxity. In other words, a motor vehicle crash cannot cause a bulging disc. This defense can be defeated with science and common sense. Sure, it is true that a bulging disc is not an acute injury. But that is not the point. The real issue is whether a disc bulge is the source of the plaintiff's pain and that pain is the result of a car accident. If you have a bulging disc and you have no symptoms, the injury is not an injury at all. When a car accident makes that dormant injury a real injury that causes pain and suffering, that is the injury for which the victim should be awarded compensation. The harsh reality is that bulging/protruding disc cases recover a lot less statistically than a herniated disc case. For bulging/protruding discs, the average jury award nationally is $140,311 ($31,000 median). In contrast, the average jury award for herniated or ruptured discs was $413,917 ($60,000 median). Sometimes, bulging disc cases are undervalued because the plaintiff's lawyer does not always appreciate the science of these cases and does not line up the appropriate experts to explain why a bulging or protruding disc can be just as painful if not more than a herniated disc in many cases. We put up a lot of sample verdicts and settlements on this website. Normally, when we describe these results, we give a long speech with platitudes about how you cannot assume that a case that sounds similar will have the same value. We have a million different ways to repeat the trite saying that the outcome of one case does not predict the value of another. Now take that speech and multiply it by 5. The variations in the settlement value of a bulging disc case will vary wildly even with the same exact facts and the exact same jurisdiction. Why? Because the credibility of the plaintiff in a bulging disc case is going to drive the value of the claim. December 2017, Louisiana: $907,016 Verdict. A 63-year-old female librarian is rear-ended by a GEICO insured pick-up truck. She suffers a disc herniation at the C4-C5 level of her cervical spine and suffered a disc bulge at the C5-C6 level of her cervical spine. For her disc bulge, she gets a facet caged fusion surgery had been performed. She also has headaches from the disc injuries she suffered. August 2017, Maryland: $40,000 Verdict. A 47-year-old man falls after the stairway handrail he is holding comes out of the wall while working at a police department complex in Baltimore City. He is diagnosed with a bulging disc in his back requiring L4-5 laminectomy and total discectomy. His lawyers sought for him over $1 million in past and future lost wages and medical bills, not to mention his pain and suffering. The jury did not agree his injuries were that signficant and awarded only $40,000. March 2017, Illinois: $222,026 Verdict. This is a pretty crazy truck accident fact pattern. A truck driver is hit by another truck in a truck stop parking lot while the plaintiff was asleep in the cabin of his truck. He gets up falls backward, hitting his head due to the impact of the collision. The other truck driver from Eagle Transportation then reverses his vehicle, causing it to plaintiff's vehicle. This causes the victim to fall backward again.He suffers a head injury, an annular tear causing a disc bulge, cervicalgia, lumbar radiculitis, nerve inflammation in his lumbar spine, lumbar facet pain syndrome and headaches. (Headaches are a common tread as much as defense lawyers try to deny the relationship between bulging discs and headaches.) Defendant's final settlement offer in the cases was $75,000. A federal jury awards $222,026. December 2013, Maryland: $290,000 Settlement. A 40-year-old woman in Anne Arundel County suffers a bulging disc after getting hit twice in a rear-end collision. She suffers a bulging disc in her back. She undergoes surgery for a nerve root compression. In all, she totaled nearly $50,000 in medical bills. GEICO was the target defendant in the case. Miller & Zois handled this case for the victim. December 2013, Maryland: $198,433 Verdict: Plaintiff, a 45-year-old nursing assistant, was stopped at a red light in Baltimore County when she was rear-ended by a vehicle driven by the Defendant. After the accident, she was diagnosed with a bulging lumbar disc that required multiple sessions of physical therapy and epidural pain shots. Eight months after the accident, Plaintiff suffered an injury at work which further aggravated the injuries sustained in the accident. Plaintiff sued the driver of the van and his employer for motor vehicle negligence, seeking $22,000 in medicals, $1,300 for lost wages and damages for pain and suffering. Defendants argued the extent of her injuries and felt the Plaintiff’s damages were limited up to the date of her work injury. The parties brought their arguments to the Baltimore County Circuit Court where the jury returned a $198,432.76 verdict for the Plaintiff. The damages were eventually capped, per a high-low agreement, at the insurance policy limits of $100,000. June 2012, Maryland: $170,467 Verdict: Plaintiff was stopped at a traffic-signal controlled intersection in Prince George’s County. While stopped, a collision occurred between two vehicles; one of which bounced from impact and struck the Plaintiff’s vehicle. Plaintiff suffered from cervical and lumbar pain, including a non-operative bulging disc. He treated for a year and a half and received multiple injections to treat his bulging disc. Plaintiff sued both drivers for motor vehicle negligence, alleging both drivers failed to obey the traffic signal. He claimed that due to the injuries he sustained from the accident, he was unable to perform his usual duties at work and lost a government contract with the IT service company that he owned. Defendants individually denied liability, contending the other was at fault. Defendant 1, insured by Union-Pittsburgh, claimed Defendant 2 sped through the intersection to beat the light. Defendant 2, insured by Erie, argued that she was unable to stop because the light had turned yellow when she was already in the intersection. Both Defendants disputed Plaintiff’s claim for wage loss and that his loss of the government contract was unrelated. The case proceeded to the Circuit Court of Prince George’s County. There, the jury found Defendant 2 100% responsible for the accident and awarded Plaintiff $170,467.